When I visited New York back in 2012 for the first time, the city energised me and inspired me in ways that I hadn’t really felt before and was the reason I wanted to come back and stay a little longer. I’ve lived in New York for the past 12 months and feel like I haven’t even yet scratched the surface of the city. Without sounding awfully cliche, everyone here has a story of getting to New York and a reason for being here and that's what makes this hub of nearly 9 million so enthralling, so full of culture and life. It’s a city where there’s just something for everyone, and that’s the just the sort of place that I want to be a part of. 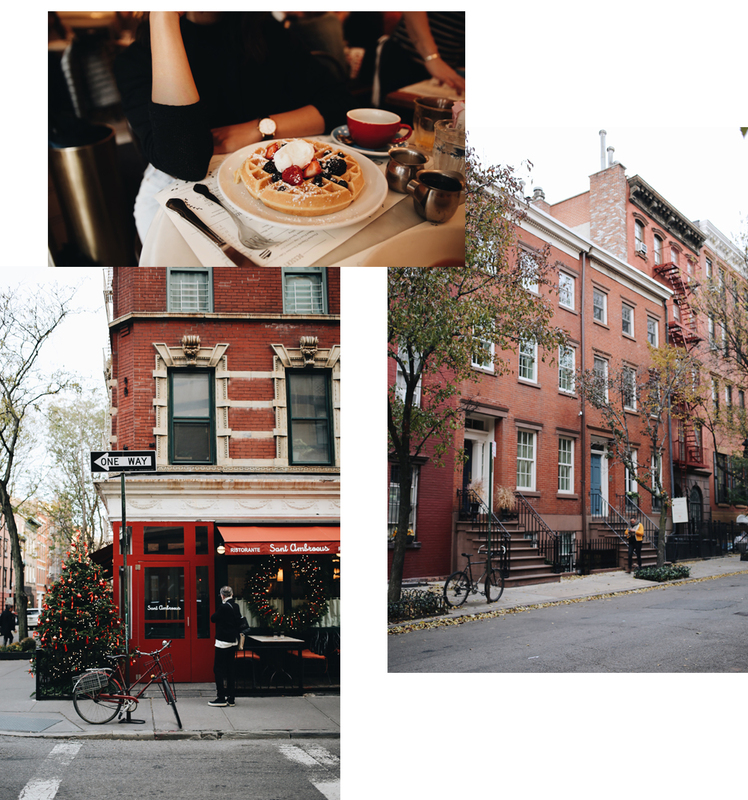 Here’s the thing about sitting down to create a guide to New York- this city is what you make of it and can be catered so specifically to you and what you enjoy. It can be the bar that goes all night, the palette of the globe, it can be the sleepy mornings in the park and the chaos of 42nd street. My New York is filled with bookstores and caffeinated afternoons, jazzy nights and musty vintage stores. You might not find some of these places that I’m about to show you on the top 20 lists, but that’s kind of why I love them. 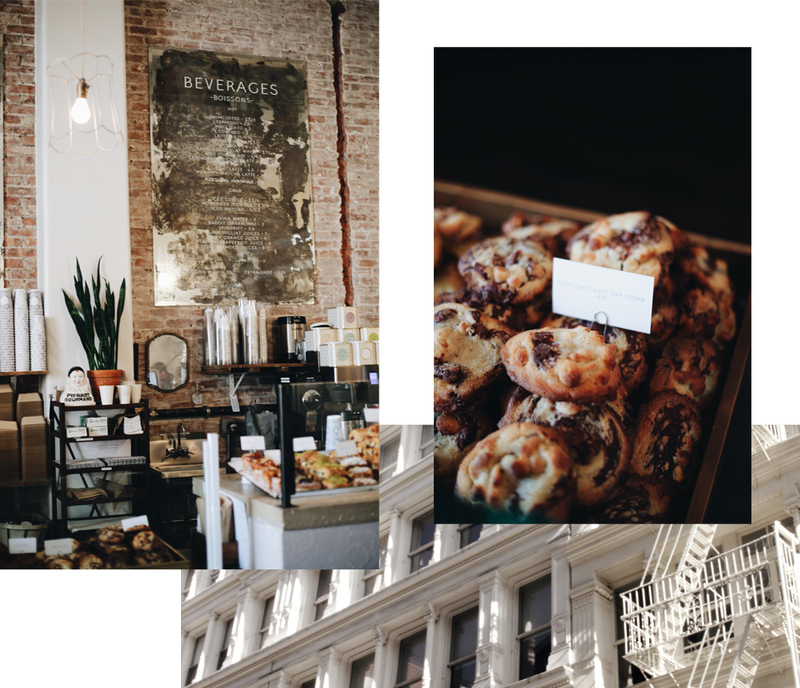 These are the areas I’ve explored most in New York and I’ve included my favourites in each. There are a few areas like the Upper East Side and some areas of Brooklyn that I haven’t seen as much of, hence why they're not included below! My first apartment in New York was on the Upper West Side, on 99th and Amsterdam. I love this area because it’s got everything you need but still feels like ‘coming home’ after busy days downtown. I spent almost every weekend and weeknight at Central Park eating dinner by the pond and watching the runaround Theatre shows in the Summer. I’ve filled countless journals here, run an ungodly amount of times around the Reservoir to only Billy Joel at this Park and had some of the best long chats from 100th street all the way down to 59th here. My favourite spots are the Turtle Pond, The Boathouse (if it’s early enough and the crowds haven't arrived yet), The Great Lawn and The Pool. Winter here terrifies me because I always manage to slip over too many times, but is worth it for the snow-covered trees and ice skating. I’ve always loved the Natural History Museum and have been a countless amount of times in the past year. You can donate a chosen amount if you wish and spend a full day or more wandering the halls. For real Southern type comfort food, Jacobs pickles is a must. Think buttermilk fried chicken, biscuits and half a dozen type of different pickles to chose from. A homey spot for raw, vegan, gluten-free comfort food. Don’t pass on dessert. My favourite vegan restaurant in the city with pavement seating for the ultimate Summer people watching session. Try the buffalo tempeh, it’s unreal. All American seafood known for their Lobster rolls. I love this place for a group dinner in a cosy setting. I love this place because it makes everyone happy and serves up hearty, healthy dishes. My absolute favourite book-store in the city, I could pretty much spend hours in here looking at their selection. A petite gift store on the Upper West Side. If you’re looking for gifts or even unique things to bring home from New York, this is the place. They carry a range of locally made gifts, stationery, home decor and accessories. Great for a morning coffee & scrambled egg biscuit sandwich. A simple spot near the 96th st station for a takeaway coffee to bring with you for a walk in the park. My second apartment in New York was up here in Harlem and I love exploring this area. There's a bunch of new spots that have opened up but plenty of Harlem classics that still remain. A no-frills jazz bar with shows on Friday and Saturdays, home of Jazz player Bill Saxton. Bill’s place serves up nothing but Jazz and is a Harlem gem. Get your tickets online to reserve a spot as the parlour is small and cosy. Tickets are $20 for an hour and a half show, with an early evening session at 8 and a late session at 10. BYO Alcohol. My friendly and spacious coffee spot which is always a great place to get some work done. The Chipped Cup has always reminded me of Central Perk from Friends. It’s an underground coffee spot that's intimate in the Winter, but boasts the perfect outdoor backyard for the Summer and is the most ideal place to enjoy a cuppa coffee and a pastry. Another little coffee store with street front bar seating and a cosy location to get some work done. The world's greatest chocolate chip cookie. I’ve got a thing for cosy ramen bars but ROKC is truly a gem in the city. Get there early and don’t pass up on a cocktail. Their unique creations like Truffle with vodka, truffle honey, muscat, grapefruit and parmigiana reggiano, or the Grapefruit cocktail- a concoction of mezcal, elderflower, grapefruit, lime and palo santo wood. Go between 5pm and 7pm for $1.50 Happy Hour oysters. An innovative Mexican restaurant in Hamilton Heights, with great cocktails, tacos and interiors. A Harlem institue, Syliva's has been serving up home-cooked soul food for over 55 years. This icon remains a culinary must-visit for foodies. My favourite Mexican spot in the city and the perfect place to grab a bite before a show. Intimate, brick-walled eatery & bar with handcrafted cocktails, eclectic small plates & a courtyard. Great food, dramatic views, away from the craze of Midtown. Quaint brick wall and wood-heavy hideaway for hearty Swiss-American cuisine. Go for a late night drink at the bar. Home to Sleep No More, the McKittrick Hotel is full of quirk and luscious spaces. In the Summer, the roof-top Garden is a getaway from the bustle and has a great weekend Brunch menu and in Winter, the space has been redecorated as a Lodge, with comfort food and drinks to match. Make no mistake though, this isn’t actually a hotel. An Aussie owned cafe that always delivers an amazing latte. The duck benny doesn’t disappoint. Traditional Thai in a trendy setting. Upscale & exceptional American comfort food. Open 24 hours but not tacky like it sounds. My favourite art museum in the city. The High Line is a 1.45-mile-long elevated linear park, greenway and rail trail created on a former New York Central Railroad spur on the west side of Manhattan. The High Line gets jam packed with tourists, especially in the Summer so my best recommendation is to get up super early and grab a takeaway coffee from Citizens of Chelsea nearby to stroll enjoy the High Line bright and early & without the crowds. With 5 locations, Tacombi is a great spot for downtown Mexican and margaritas in a rustic, warehouse setting. I love Westville for their sides which are always bomb. Whether for breakfast, lunch or dinner, Westville is a reliable go-to with tonnes of healthy options. A Legendary circa-1915 cafe that's a New York landmark. Come for the drinks. I had the best sweet potato soup I’ve ever had here recently. This unique coffee spot is tucked away in the heart of the West Village and is filled with plants and eclectic seating and has an extensive drinks menu. It can get busy though, so try and go early if you’re looking for a laid-back vibe. An Aussie coffee joint that makes home feel a little closer. A small basement coffee bar and store. A cafe where you can spend hours playing from their selection of hundreds of boardgames & card games. A snug little bookstore that's been around since 1968. An eclectic selection of coffee table & art books. I always find myself starving in Soho after a day of shopping and Hampton Chutney Co is my go-to for filling Indian dosas that are served with your choice of homemade chutney. This Aussie owned cafe has a great breaky menu and brew as well as $8 Happy Hour cocktails from 4pm - 7pm. When I’m missing my side of the world, Banters menu and casual space has me feeling like I'm in Melbourne. Rustic-chic eatery serving up Chicken and Waffles with vegan chicken options too. A quirky ice-cream parlour with flavours like burnt sage, banana curry, black coconut ash and sherbet froyo as well as all the classics. You can't go wrong with a piece of homemade pie and a cup of joe here. Vintage dim sum parlour dating back to 1920. New York outpost of the San Francisco eatery serving fiery, innovative takes on Sichuan cuisine. Organic food where there's something for everyone. A great open space that's perfect for a long lunch. Tictail has to be one of the most well-curated boutiques in New York. Bringing together independent artists, makers and brands and selling everything from home decor to fashion and gifts, Tictail is a global marketplace. Where all your succulent dreams come true. An extensive magazine selection on offer. I always find myself here on a rainy day at their Soho store with a hot cookie and coffee in hand. A simple little Kiwi owned coffee shop in the big apple. Surf & lifestyle shop meets coffee bar. Best in Summer so you can sit in the outdoor garden. A cute lil coffee shop with homemade nut mylks. My favourite little bakery in the city creating dairy-free, egg-free, soy-free, gluten-free & agave-sweetened cakes & cookies. An 1863 preserved tenement building brings Lower East Side immigrant stories to life with guided tours. Located right underneath the Williamsburg Bridge. This low key saloon has a movie screening room and stocked bar so you can sit and enjoy a flick with beer and pub grub in hand. Is there actually anything better than a bar where you can play classic video games? A huge foodie market with vintage stalls too. A low key, Williamsburg coffee hangout. Champs is an all vegan diner serving up all the diner classics. Try the Tempeh Buffalo bites. During the day, this family-owned Moroccan restaurant is the perfect place to sit with a coffee, and on weekends and evening hosts a busy brunch and dinner crowd. You must try the hummus and the halloumi eggs. There are two locations, on in Brooklyn and one in Manhattan but my favourite is the Williamsburg one. The name says it all. Make sure to leave room for dessert because the banana cream pie is everything. Homey little cafe for sweet & savory vegan crêpes! Stella Dallas is my favourite vintage stop. With a home store located right next to the clothing store, there’s endless racks to explore in this perfectly curated Vintage collection.